The Chamber recently hosted the 15th Annual Riverside College and Career Fair, presented by Bank of America. Over 7,000 high school students, college students, and their families flooded both floors of the Galleria at Tyler to gain a one-stop access to future education opportunities and career pathways. Counselors from Riverside, Alvord, and Jurupa Unified School Districts, and local colleges and universities provided free information on financial aid, college eligibility and admissions, interview tips, and resources for each student’s next steps. 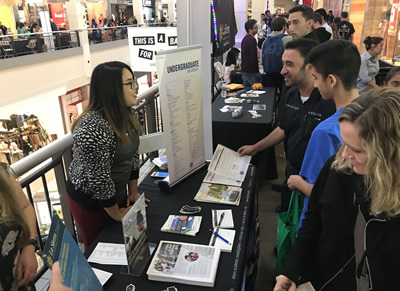 Over 120 colleges and universities exhibited and highlighted educational pathways to students and over 70 local businesses and support-resources organizations participated. They educated attendees on career pathways and had the opportunity to build relationships for future internship and business opportunities. Businesses that did not have the opportunity to participate as an exhibitor this year, should keep this event in mind for next year since space is limited. Do not miss the chance to make an impact on Riverside’s future workforce by educating students and providing information and resources on career pathways. The Chamber donated four laptop computer systems to four local high school students to assist in their future educational endeavors. Through this event and other initiatives, the Chamber’s Business Education Partnership Council works to support local education. Strong local education leads to an educated workforce and a strong local economy. Next year’s event will take place on October 3, 2019.